In August my wife and I took a short trip to the North Fork of Long Island to explore and to taste some wine. We stayed at this cute hotel that is a re-modeled '50s motor inn, we took nice walks around Greenport, had an amazing lunch at Jedediah Hawkin's Inn, and we had some very good wine. In fact, we were genuinely surprised by how much we liked some of the wine. They really are trying to do their own thing out there, not making big fruit bomb wines, but instead making wine in a more elegant style. I read somewhere that the LI wine industry is going more for an old world European style of wine. We especially liked the wines at Castello di Borghese, a Cutchogue winery owned by an Italian Prince and Princess (although they apparently put the winery up for sale). Their unoaked 2005 Estate Sauvignon Blanc was fresh and lively. We emerged from our tasting there with a few bottles of their 2002 Cabernet Franc Reserve and a 375 ml of a 2004 zippy desert wine made from late harvest chardonnay called Allegra. We also enjoyed a visit to The Lenz. The 2004 Gewurtztraminer had wonderful aromas of litchi and other tropical fruits, but didn't have the palate to go with the scents. The 2004 Old Vine Chardonmnay was quite good, but it was the reds that really impressed me. The 2000 Estate Selection Merlot is an excellent Bordeaux-styled wine, with plummy and earthy aromas, a light texture, and lots of dark fruit on the palate. 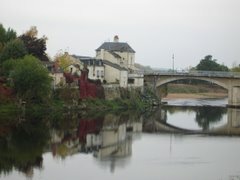 There's a persistant irony minerality there too. It could probably age a few more years and at 23 bucks a bottle, its a good value. Careful of the sediment though - each bottle we've opened has had a lot of it. So now I know that Long Island makes serious wine...what about the rest of New York? I keep hearing about the finger lakes and their riesling. I don't know much about riesling. I've tasted maybe 10 in my life. But I am curious, so yesterday, wandering around with an hour to kill, I went into Vintage. Vintage is a wine store that sells only New York wines, and also some fancy foods. At their Soho location you can saddle up to the bar in back, and for merely 10 clams you can taste any 5 wines you like, regardless of the bottle price. 2005 Chateau Lafayette Reneau $16 - very light yellow with green smells of melons and flowers. Effervescent in texture with melons, citrus, and stones on the palate and a light citrusy finish. This is a fun wine, good for summer on the deck, but not memorable. 2005 Lamoreaux Landing $18 - light golden hue, very reserved nose. peaches and flowers with pronounced citrus through the long finish. Pleasant, but somehwat simple, and I wouldn't seek out this wine or choose it at a restaurant. 2005 Hermann J. Wiemer $25 - full yellow, floral nose with some lemon balm and rainwater. rich and pure flavors of lemons and apples with an intense floral finish - jasmin? violets? So I guess this is what all the fuss is about. It dances around in your mouth and makes me feel like when I was a kid at the Bloomingdales perfume counter - great smells and something adult happening all around me. I actually had a glass of this wine recently during dinner at the Tasting Room with the in-laws, and I really enjoyed it with my fried blowfish tails. I don't know if this is a good value because I don't have a riesling context yet, but I sure loved the wine, and I grabbed 2 bottles of it for the cellar. 2004 Chateau Lafayette Reneau Johannisberg Riesling $16 - almost white in color with rainwater, flowers, and lemon rind on the nose. Effervescent but thick mouthfeel - I could see the bubbles in the glass this time - with melon and stone fruit flavors and a lingering floral finish. Again, I like it, but it is not inspiring me to go out and go crazy on the riesling. 2005 Dr. Konstantin Frank $17 - I might be prejudiced against this producer. He sort of occupies a "McDonalds of the Finger Lakes" spot in my wine psyche. Why? I have no idea, other than his wines are popular. Unfair - yes, but what are you gonna do about it? White fruits on the restrained nose with citrus, green apple and grapefuity acidity. The finish is awkward with some pronounced sweetness but no clear fruit or honeyed flavors. Whatever, you're going to have to put in some serious time and bottles to get me to open up to Dr. McKonstantin. All in all - New York wine = YES! I will continue to explore, and you should try some too. Three months ago when my buddy Dee-trane and I were talking about how we wished for more opportunities to taste wine together, our monthly wine dinner was born. Last night was our third installment. 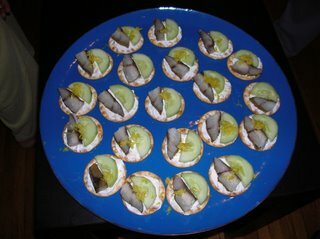 We served hors d'oeuves of farmers market smoked bluefish and creme fraiche on crackers, and home-made olive bread twists. I cracked open a bottle of NV Egly Ouriet Brut to go with the bluefish. 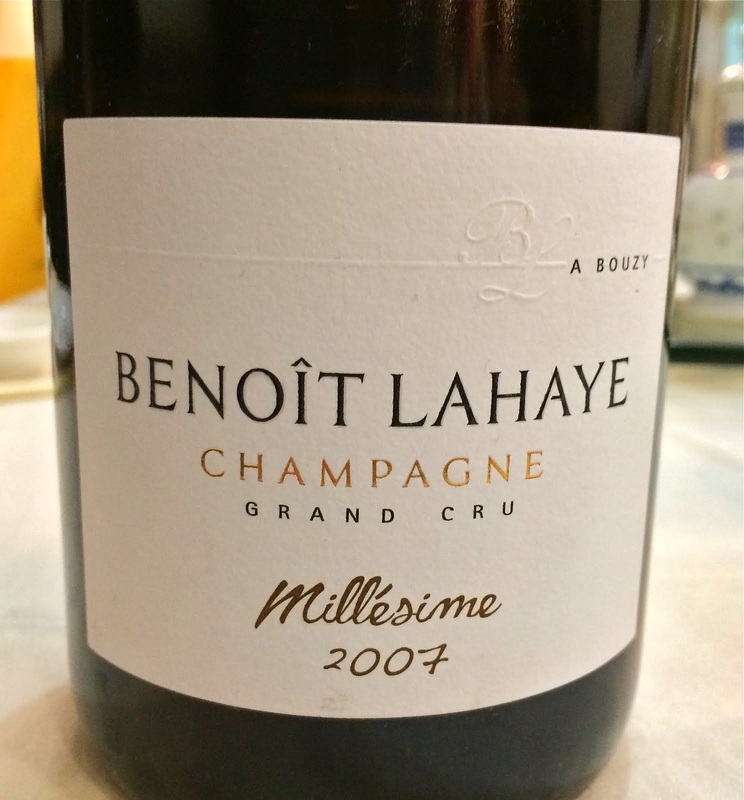 I have never tasted this champagne, and after reading several good reviews from the last Wine Blogging Wednesday at the Becks & Posh blog, I decided to give it a go. It was deep golden yellow with strong aromas of bread, flowers, and something like golden raisins, and it was really fruity and powerful. People seemed to like it more than they liked the bluefish bites. Even though I sprinkled lemon zet on them and served them on my wife's beautiful blue enameled platter, they were barely half gone when we sat down to eat. People are clearly prejudiced against bluefish, and I, for one, think it stinks. Mike (who couldn't be there at the last minute) and Jess brought a 2001 Morellino di Scansano from Moris Farms. This wine was just delicious, my favorite of the night. It was deep purple with well delineated smells and favors of plums, tobacco, and leathery earth. It had a smooth velvety texture too with very fine tannins. That said, it was a big wine and it was not a good pairing with the fall vegetable salad. Dee-trane brought a 1999 Le Gode Brunello di Montalcino to pair with the shortribs. Now this is an $80 bottle of wine, and Dee-trane went through great lengths to get it (more on his story about buying stolen wine from the criminal ex-manager at Esca another time). But we all agreed - there just wasn't much happening for us with this wine. No fruit to speak of, nothing on the nose. Completely innocuous. Maybe a bad bottle or a dumb phase, but completely unimpressive. Adam and Tyrie brought a 2002 Durigutti Reserve Malbec from Mendoza, Argentina. Everyone liked this wine, and why not? Dark purple and intense, scents of dark fruits, some vanilla, and some spice. Velvety texture, and a sweet, young fruitiness that complimented the rich shortribs. I opened a 1996 Chateau Pierre-Bise Coteaux du Layon Chaume with dessert. I love Loire Valley sweet wines. They are complex with flavors of baked pineapples, creme brule and toffee, spices, citrus and honey, and they can have wonderful acidity and minerality too. This one was no exception - beautiful round flavors, scents of savory spices like mace, and a racy acidity that lingered on and on. 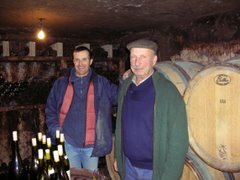 For a great piece on Chateau Pierre-Bise check out thewinedoctor's. Interesting wines and great company - what more could you ask for? I'll tell you what - no more bluefish. Hello, I'm Brooklynguy. I grew up in Manhattan but I've lived in Brooklyn for the past 10 years, and I'm never going back! I love Brooklyn. I also love wine. I love experiencing wine with other people who are also curious about wine. I love tasting, thinking about, reading about, and learning about wine. I will share my experiences with wine and food, and I promise to try to add some sort of value - this will not simply be a diary of what I drink and eat. I will offer opinions, recommendations, and ask questions, and I hope to stimulate you to try a new wine, or a new food/wine pairing, or tell you about a great wine shop, or to let you know about where to find something particularly tasty to eat. And to be completely honest, I want to participate in Wine Blogging Wednesdays, the brilliant community wine tasting started by Lenn at Lenndevours. from what I can tell, only wine bloggers can participate. What a wonderful way of sharing wine thoughts and tasting experiences with a community of interested people! I have no financial interest in anything food or wine related. Anything I write about I share because it means something to me, and it might mean something to you. If you like Loire Valley sweet wines, at Prospect Wine Shop you can buy a bottle of 1998 Domaine Des Baumard Quarts de Chaume for under $40. Try finding this wine at another store...or look on an auction site like Winecommune and you'll see that this price is usually about $60. I bought one bottle and I haven't had the occasion to open it. On Sunday I stopped by Prospect to buy an inexpensive red wine to use in braising the short ribs I will serve tonight at our September Wine Dinner (more on that tomorrow). But who doesn't need wine while cooking? I emerged with a bottle of sparking red wine made by Alain Renerdat from Bugey (pronounce the "g" like a "zh"). This bright and fruity sparkler is packed with red fruit - sour cherries and strawberries. There is also something slightly dusty, earthy on the finish. It is definitely off dry, and probably best for a single glass as an aperitif, or with some sort of smoked fish appetizer, hopefully on the deck. For 17 bucks I felt like I got my money's worth. And at only 7.5% alcohol, I could make my way through the whole bottle over 4 hours of cooking and not get too whacked out. More on Prospect Wine shop soon. I have to prepare for tonight's wine dinner.